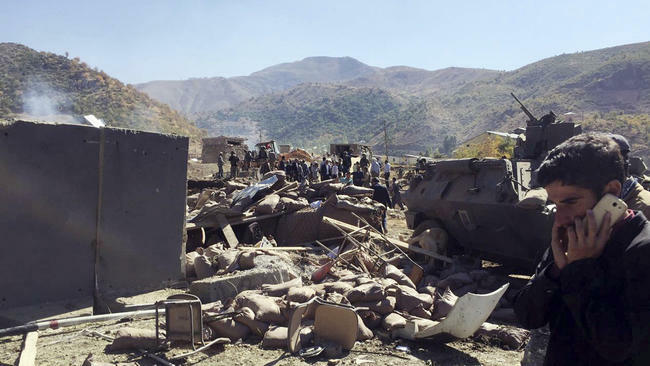 Kurdish militants detonated a car bomb Sunday outside a military checkpoint in southeast Turkey, killing ten soldiers and eight civilians, the Prime Minister said. Turkey immediately launched a military operation against the rebels in response. Prime Minister Binali Yildirim gave the death toll during a press conference in Istanbul and condemned the attack. “For the stability of our country, we will continue doing everything we can to save our homeland and our nation from the forces of terrorism,” he said. Cuneyit Orhan Toprak, governor of Hakkari province where the attack took place, told that private news channel NTV that 27 others wounded in the attack were rushed to nearby hospitals for treatment. Eleven of them were soldiers, the Turkish military said. Turkey’s state-run Anadolu Agency, citing a statement by the Turkish Armed Forces, said the attack occurred at 9:45 a.m. outside a Gendarmerie checkpoint on the Semdinli-Yuksekova highway and was the work of the Kurdistan Workers’ Party, or PKK. The checkpoint is 20 kilometers (12 miles) from the town of Semdinli. Toprak said the attackers first opened fire on the soldiers at the checkpoint to distract them before driving up a minivan containing about 5 tons of explosives and detonating it. The explosion produced a crater 15 meters (50 feet) wide and 7 meters (23 feet) deep. An infantry station located behind the checkpoint also suffered heavy damage. Turkish authorities imposed a temporary blackout on coverage of the attack, citing public order and national security reasons. Energy minister Berat Albayrak condemned the attack during a speech in Istanbul. “I would like to remind all friendly countries that there is great need to take a common stance and display solidarity against terrorism,” he said. “We remain steadfast in our support for our NATO ally, Turkey, and reaffirm our commitment to continue working together to defeat all forms of terrorism,” Price said in a statement released Sunday night. Turkey has been rocked by a wave of bomb attacks since last summer that have killed hundreds of people and been blamed on either the PKK or the Islamic State group. Fighting between the PKK and the state security forces resumed last year after the collapse of a fragile 2 ½-year cease-fire. Since then, more than 600 Turkish security personnel and thousands of PKK militants have been killed in clashes, according to the Anadolu Agency. Rights groups say hundreds of civilians have also been killed in the fighting.